Two brothers go to Viet Nam and are caught in some of the bloodiest fighting of the war. Only one comes home. Matthew Manning receives a hero’s welcome when he returns to his small Iowa hometown…but he’s no hero. If his family and friends knew the truth—that he’d been the cause of Marcus’s death—would they be so welcoming? But the unexpected love of a woman helps him recover from the horrors of war and his consuming guilt over his brother’s death. 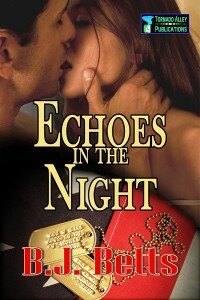 Together, can they banish the Echoes in the Night?